It's happened to me in Florence too. It's a sort of amnesia. And I'm getting used to it. In Reggio Emilia I had to be at a Tai Chi class absolutely on time. Absolutely. I was staying with friends and insisted I didn't need their help to find the class. Just drove around for half an hour, spiraling around the inner city ring road where every road looked the same. And then I thought 'I've blown this' turned down a side road, turned off the engine, made an huge deep sigh, looked out of the car window and guess what? There it was, the Tai Chi centre down a little road and just in view of where I'd parked. Same this time in Venice. my telephone battery ran out of juice. Couldn't call friend, couldn't locate house. Began to ask folks passing by and nobody had heard of either her or her house. Amnesia sets in and I find myself twenty minutes later in the beautiful piazza Campo Santa Margherita. Quite an amazing place, and it's dark and moody and full of people spilling out of bars and shops; Christmas lighting the way only Italians know how to do. And I thought this is good. And I let go. I was coming to my senses now (if I dare say that) and saw clearly the road I had entered the Piazza through, retraced my steps, and found myself in familiar territory. As I turned a corner there was a lady and her daughter about to enter a house and I asked if she had heard of la Ca della Corte and she said 'Yes it's right there' and pointed to this iron gate, one which I had passed a dozen times. If you are still awake, you might have got the gist of the story, so I won't bother to tell you about how I got lost again the day after and nearly missed my train back to Marche. And I won't even mention the near death experience in a Gondola. 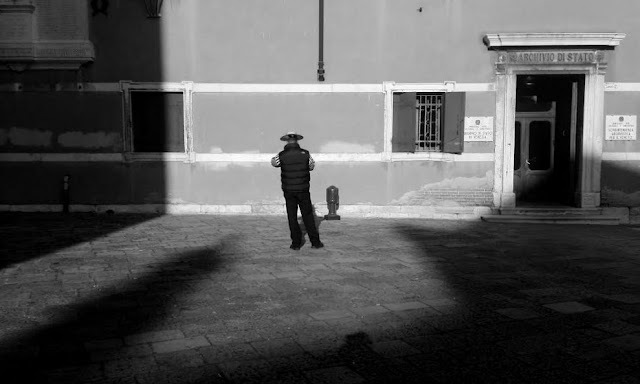 So, that more or less sums up what my photographic workshops are about, being absorbed in the rhythms of life, instead of trying to control it (in this case Venice).